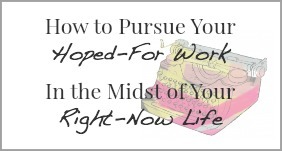 On February 24, 2016 I sat down to write a tidy little post for those of us who feel like our right-now lives are keeping us from our hoped-for work. I ended up with an entire series on the subject, eight posts in all. It’s continually relevant because it’s a tug-of-war we experience every day. How do we live responsibly in the right-now while not letting go of the hoped-for? This “balance” is not for the faint-hearted. Not only do you battle the limitations of the right now, you battle the voices of the right now. Do you actually think you’re a real writer, a real artist, a real counselor, a real photographer, a real teacher, a real leader, a real coach? Aren’t you neglecting other things that could use your attention? Wouldn’t it be easier for you to let go of this dream and settle for a normal life? The answer is yes. To all of those questions. And that’s why we need encouragement. Because making space for our hoped-for work when there are sheets to wash and kids to raise and a real job to show up for takes creative strategy and courage. Sometimes we’re convinced that the voices are right. We’re tempted to close the coffin lid on our hoped-for work, cry a few tears, and move on like a responsible grown-up. I’m mostly for all for being a responsible grown-up. But I wrote this series because I don’t think the answers are as “all or nothing” as we assume. There’s hope in the messy middle. 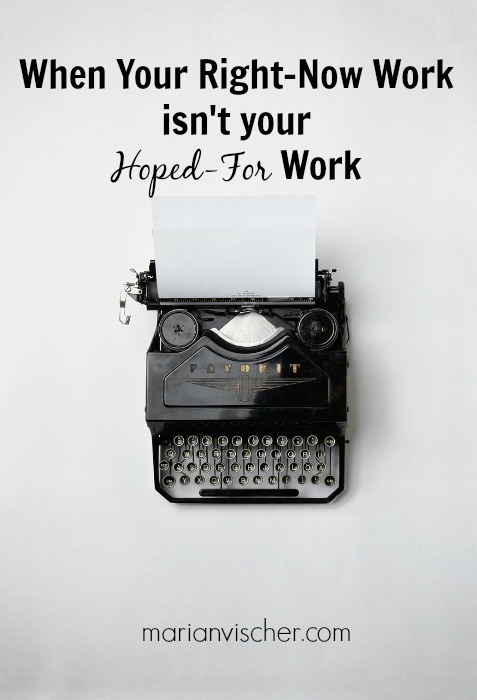 2 Ways to Give Your Hoped-For Work a Voice. Right Now. Need soulful encouragement + real-life tips for living your ordinary life with extraordinary purpose? "The Sacred Art of Receiving Your Right-Now Life" begins late January, 2018. 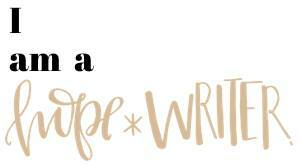 Love to write? Join us! Visit Marian's profile on Pinterest. 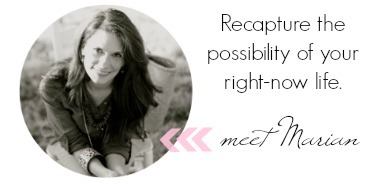 Need soulful encouragement + real-life tips for living your ordinary life with extraordinary purpose? Subscribe & you'll receive each post to my new series, "The Sacred Art of Receiving Your Right-Now Life." Begins late January, 2018. Spam is the worst. I won't share your information.